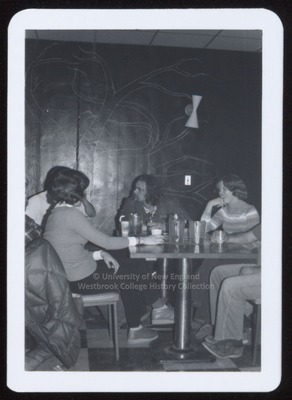 "Five Students with Beer Pitchers, Westbrook College, 1970s"
Five Westbrook College students share a table and several pitchers of beer in this 1970s candid black and white snap shot. Behind the students there looks to be a wall painted with blackboard paint. A tree trunk and branches is drawn with chalk on the blackboard wall.